Contrary to popular belief, rock and roll music never quite died; it’s more that utterly terrible music wrongfully snatched the spotlight away and called itself rock. Yes, there have been several bands that have sprung up to fight the good fight (and have done a great job at that, too), and while this could very much be focused on the progression of the genre from its early years, it won’t be, because instead, this is about one of the newest bands to “fight the good fight,” ’68. Frontman Josh Scogin made it known almost immediately after the announced passing of The Chariot that he had no plans to retire from creating music, but the ways in which he uncorked the bottle that is ’68 in one of the most punk-rock ways possible made the existence of Midnight all the more of a surprise. By means of a YouTube live performance video which had not revealed any song titles and only a name for their duo, Scogin and ex-Becoming The Archetype member Michael McClellan decimated expectations with the rousing “Three is a Crowd,” a song that was included on the band’s debut two-song 7″ which saw no pre-order phase and was made available through a webstore in an extremely limited run. If there’s one widely-known comment about The Chariot’s sound, it’s that there is not one label that can accurately describe what’s going on, and this is something that can carry on into ’68. There’s an undeniable clash between two worlds on this EP, seeing as how the sounds which contribute to that come from thrashy, fuzz-smothered, pitch-shifted guitars, pounding drums, and a wide array of vocal techniques that range from screams to genuine off-key singing. To some, this is something that could either inspire nostalgia of some of the noisier and gritty bands of the 90s, while to others, this could bring up distasteful memories of that band who rehearsed next door and never made it past playing a couple of local gigs. For what it’s worth, I’ll personally admit that this brought me back to my high school days of jamming with friends, back when the only gear I had was a 15-watt amp, a cheap multi-effects pedal, and a beater Epihpone. We played sloppily, had no definitive genre, no “completed” songs, let alone any work in progress that was written with a key in mind, but nothing could or will ever take away from the fun that we had through it all. At a pace and duration that could be comparable to a mechanical bull-ride, this record hinges on the expected and unexpected. For instance, the slowed down chorus-esque part towards the end of “Three is a Crowd” brings into perspective that the similarity between Midnight‘s re-release art and the cover of Bleach is no coincidence at all. “Third Time Is A Charm” incorporates southern gospel tinged “whoas” that help to separate this group from the other heavy bands who’ve attempted this same approach. Midnight is a rather thought-provoking debut release title for this group. It may bring up some darker presuppositions, but it would be much more fitting to look at it as the transition from one phase of Scogin’s career into another. 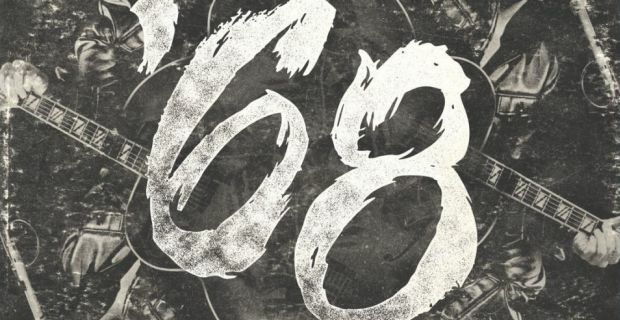 Who knows what the future may hold for this project, but if this EP indicates anything, it’s that ’68 could very well be on track for one awesome “day” of a career ahead of them.